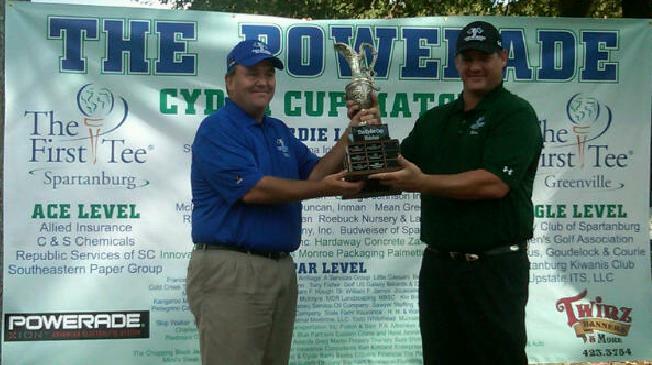 The 2010 Powerade Cyder Cup ended after Greenville won 9 matches on Sunday afternoon at River Falls Plantation. When the day began, Greenville only needed 5.5 points out of the possible 16 to take the win in an event to benefits The First Tee Programs in both Greenville and Spartanburg County. Greenville player Bobby Hines clinched the victory on the 18th hole winning 1 up over Rodney Austin, and Greenville would go on to a 20-12 overall victory. Spartanburg still leads the overall series 4-3 dating back to 2004. "We are happy to have regained the Cup and it was very satisfying to win every session over such a good Spartanburg team" Greenville captain Whit Suber stated after receiving the prestigous Cup. Spartanburg Co-captains Brian Kennedy & Max Fain said while the competion is intense, the teams are playing with a higher calling. Kennedy said "All the guys want to win these matches, but hopefully the real winners were the kids that have the opportunity to participate in The First Tee programs." Fain agreed, also "wishing to thank Powerade for continuing their support as title sponsor." Combined, the Greenville & Spartanburg teams raised approximately $30,000 that will be passed along to The First Tee of their respective counties. Congratulations to Greenville County in winning possession of the Powerade Cyder Cup! 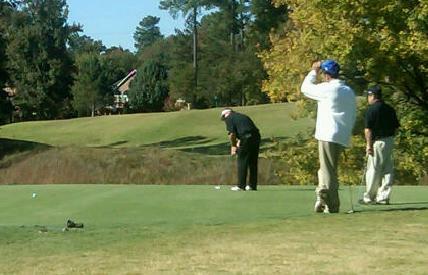 The 2010 Powerade Cyder Cup matches are off to a good start for the Greenville County team. The Ryder Cup formated style event is taking place at River Falls Plantation and matches 16 golfers from each county in a team tournament. After leading 4.5 to 3.5 points following the morning four ball matches, they caught fire in the afternoon modified alternate shot matches. Greenville won 6.5 of the 8 total points available to take a 11-5 lead into the final day and needs only 5.5 points to take back the Cup. On Sunday, the golfers will be matched up in 16 singles matches. The event benefits The First Tee programs in both counties and remains a very spirited rivalry but friendly event. Come out to River Falls on Sunday and watch some of the best amateur golfers in the Upstate! Admission is FREE. 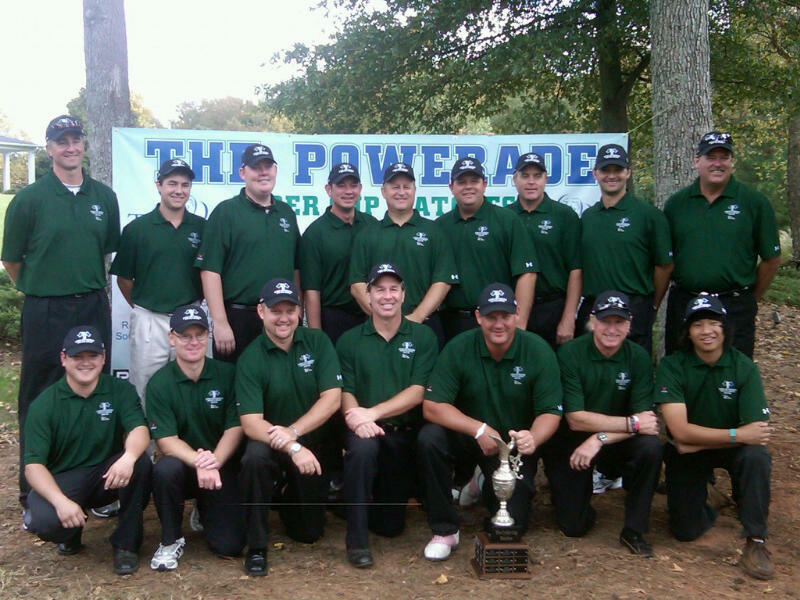 The teams for the 2010 Powerade Cyder Cup have been announced by their captains - Whit Suber (Greenville) and Brian Kennedy (Spartanburg). The Cyder Cup matches will take place at River Falls Plantation on October 23-24, 2010. This is the seventh year of this event and Spartanburg County holds a 4-2 lead over Greenville County. This event raises money that benefits the First Tee programs in each county. Copyright © 2019, Upstate Golf Club. All rights reserved.